Long time no see, guys! I sorta took a little hiatus after arriving home from Seattle Monday night. My trip was incredible… we saw all the things, ate all the food, and I’m trying to get the best of my photos together so I can share it all with you. I’ve also been sick, and dealing with a couple of curve balls as well as busy kid schedules this week; blogging just had to take a back seat for a few days. 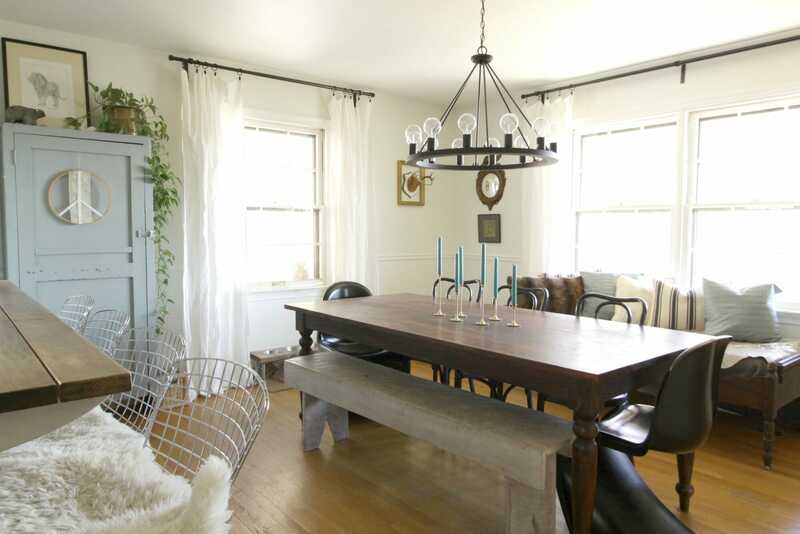 But I am back, and today I am going to share with you my spring tour: living & dining room edition. 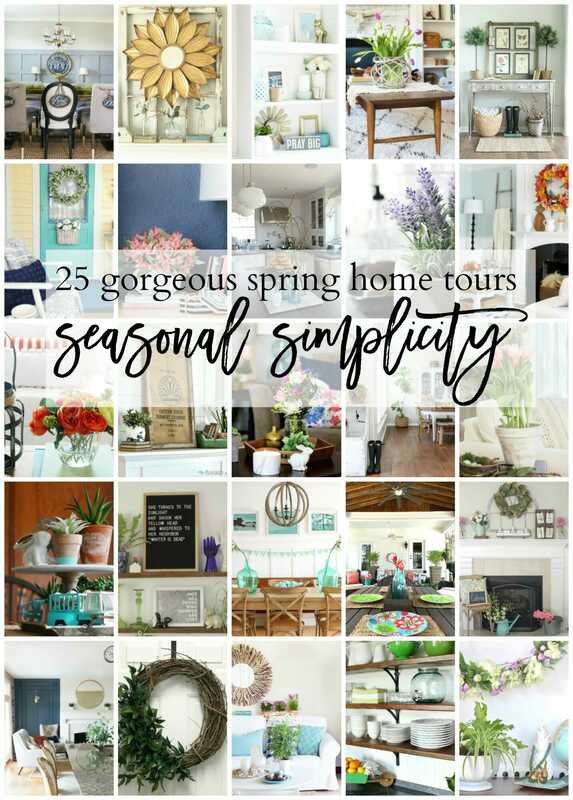 If you’ve been following along with the Seasonal Simplicity Tour put together by Krista and April, then you’ve made it to the fifth and final day. If you’re hopping over from Town & Country Living, welcome! And if this is the first home you’re checking out, then be sure to hit up the list at the bottom of this post so you don’t miss any of these inspiring Springified homes. If you’ve been reading my blog this year, then you know my mantra has been “spend less.” I am happy to report that I used mostly what I had for this tour, and the only flowers you’ll see came from the bulbs I planted last fall. (That’s why there are only a few, too! Still not quite spring weather here in Maryland.) Spring is always a great time to add a little more color to our homes, and lighten up our spaces visually both through color and texture. I’ve always been a blue and green lover, and happen to have pillows, accessories, and more in those shades. Working with what I had and colors I adore, I added loads of blues and greens to my home for Spring. In the living room, most of my plants were already there as they come in for the winter… instant green! I removed my heavy feeling red Persian rug to lighten the room, and added several different pillows for color. On the gray West Elm sofa, I brought in blue boho pillows handed down to me from a friend a few years ago, a beautiful green pillow for a little touch of vibrant color, a blue pillow I did purchase at Sweet Clover last month (but it was the pair for $20 and I loved them! 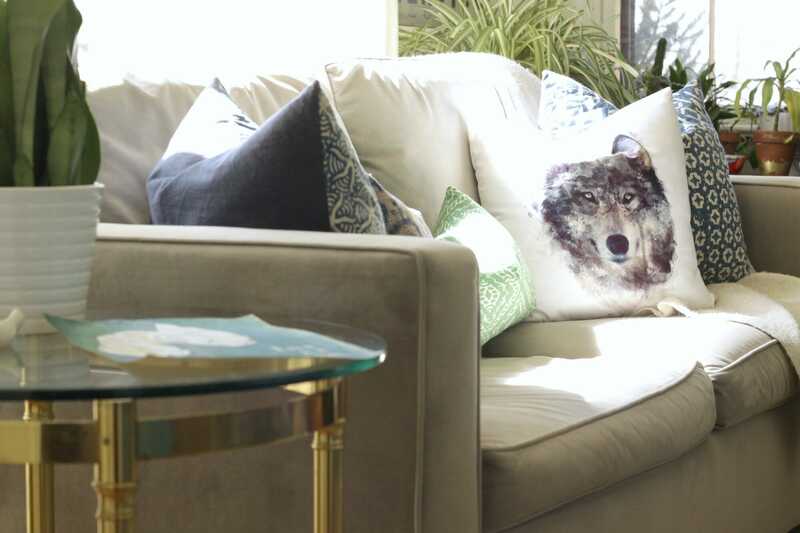 ), and my wolf pillow I purchased last Fall. Even though I bought the wolf for Halloween, I feel like he works well for Spring when all the animals are coming out from winter’s hibernation. I love this combination of color which isn’t overly springy as I don’t really do too much pastel in my home. 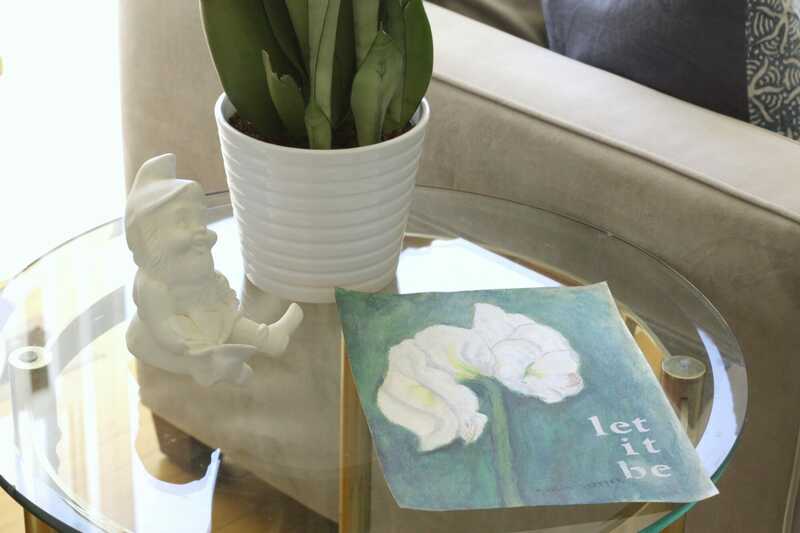 On the side table next to the sofa, I set a piece of inspiring art in the right colors, as well as a little potted snake plant, and a gnome. The art was found at a yard sale a couple of years ago, and I added the wording. I have a few similar pieces in my etsy shop now. Across from this sofa (known as “his”) is the “hers” sofa… aka my vintage navy blue beauty. I had so much fun pulling together pillows to bring in some of that green and blue combination that makes my heart sing. The blue dot pillows are from Ikea years ago, and the green banana leaf tropical pillows come from Shelby Dillon Studio. Aren’t they just stunning? The ladies over there were kind enough to send them to me, and they truly make the sofa right now and give it such life and vibrancy. The small plush blue pillow is the match to the other one on the gray sofa. The banana leaf pillows tie in beautifully to the teal dresser which now sits in our living room. 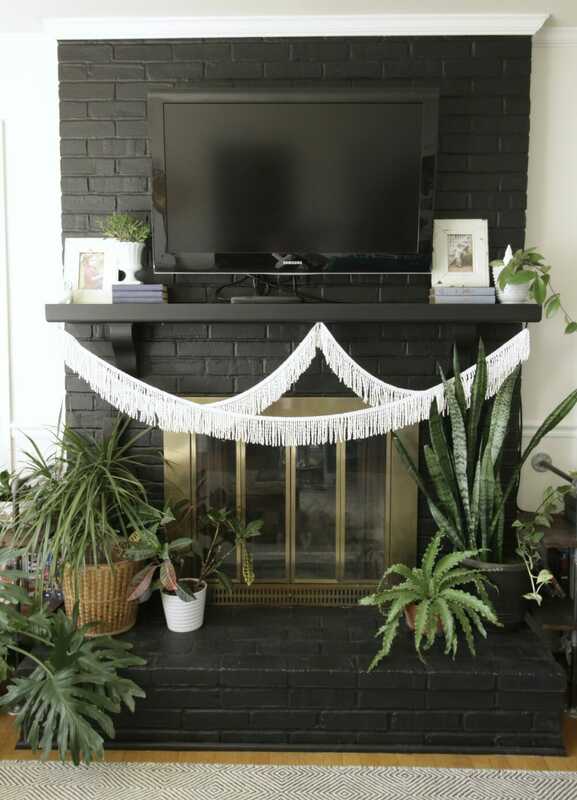 I kept my mantle really simple this Spring, and just used some vintage books I already had, a couple of my plants, and old photos of my kids from spring time. I’ve had the fringe up for a couple of years almost now… I haven’t stopped loving it yet. Part of the fun of trying to spend less is that you really dig through what you already have on hand and try to use things differently. Surprisingly in the 5 years we’ve lived here, I’ve never put photos on the mantle. There’s a first for everything, right? I recently took a bunch of photos down in the hallway as it was just feeling too cluttered for me, and I was glad to reuse them here where I can enjoy them more. Old photos of my kids make me weepy in a good way. As you can see I also added a little white owl next to the photo of Emmy. Sawyer got a little gnome on his side. 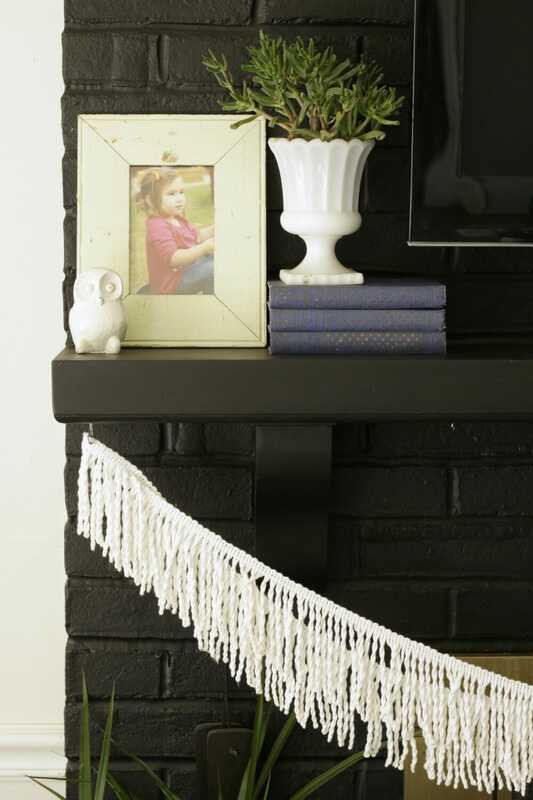 I much love a balanced space, but I tend to dislike symmetry, so as you can see my mantle is balanced but not symmetrical. In the center of the room sits one of my prized vintage possessions… my glass waterfall coffee table I won at an auction. I changed up the look for Spring by changing the books a bit, and I removed my heavy leather tray in exchange for a round woven tray with a touch of pink. On the tray I placed my favorite candle (volcano by Capri Blue) , a zebra hide tray that was a gift, and a jade plant. 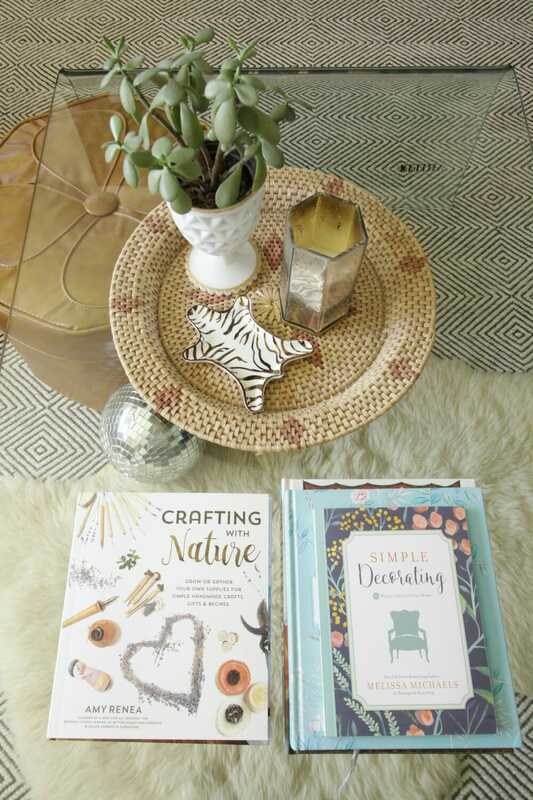 Since it’s time to get back outside and back to nature, I brought out my Crafting with Nature book to inspire me. 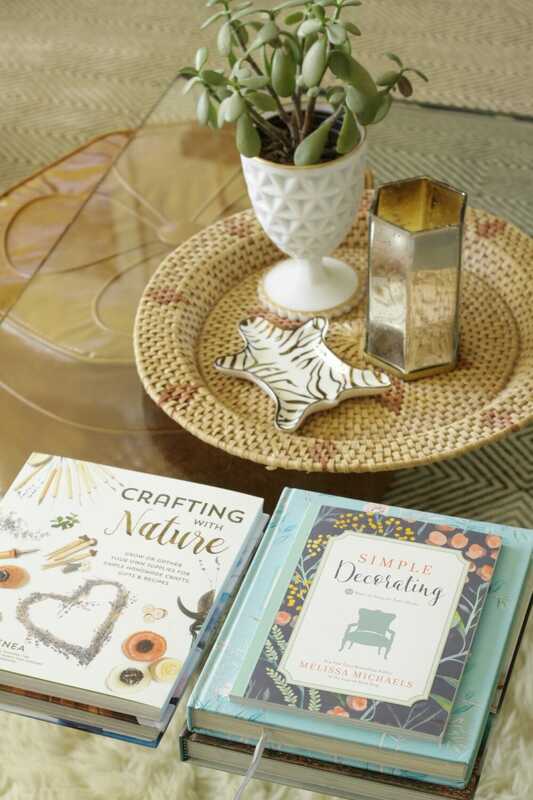 A recent addition to my collection is Simple Decorating by Melissa Michaels of The Inspired Room (to be released April 1, but you can pre-order on Amazon). I just received this book, and can’t wait to dive in as I am all about simple right now in my life. If you said “straw hat” then you guessed right! I bought some straw hats last spring for staging at Sweet Clover. 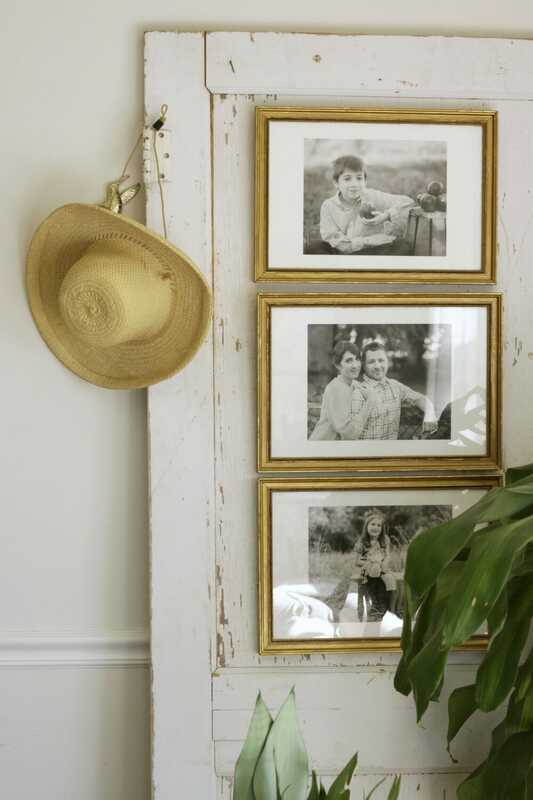 I hung one on the old door in our living room just for a little touch of texture and warmth. Let’s head on into the dining room now, shall we? 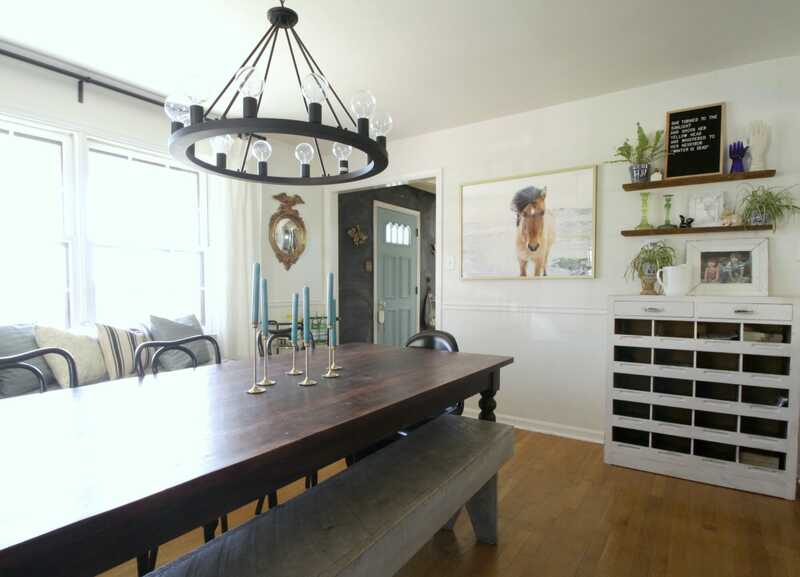 Again, this is the “Seasonal Simplicity” tour and trust me, this space is all about simple right now. 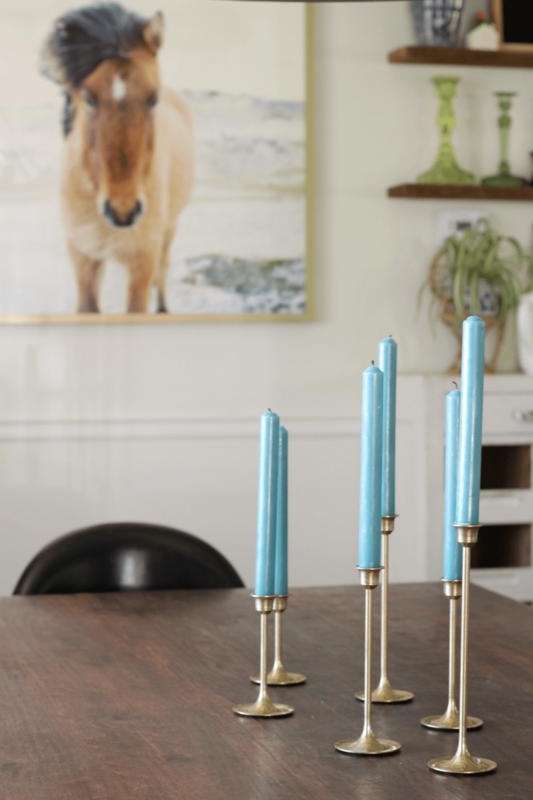 On the table, I simply added color by adding colored candles to my brass candlesticks. You might notice that I pulled up the cowhide rug as well just to lighten the space. 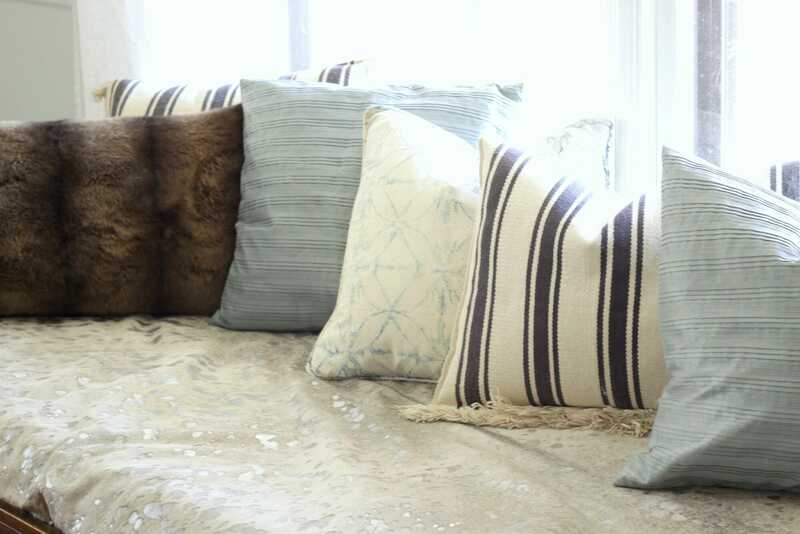 On the daybed I changed out pillows to various shades of blue and aqua. Rather than put the cowhide away, I added it to the daybed as well. The dogs spend a lot of time napping here, and a hide is pretty pet resistant. This particular hide adds a little sparkle, too… always a plus in my book! 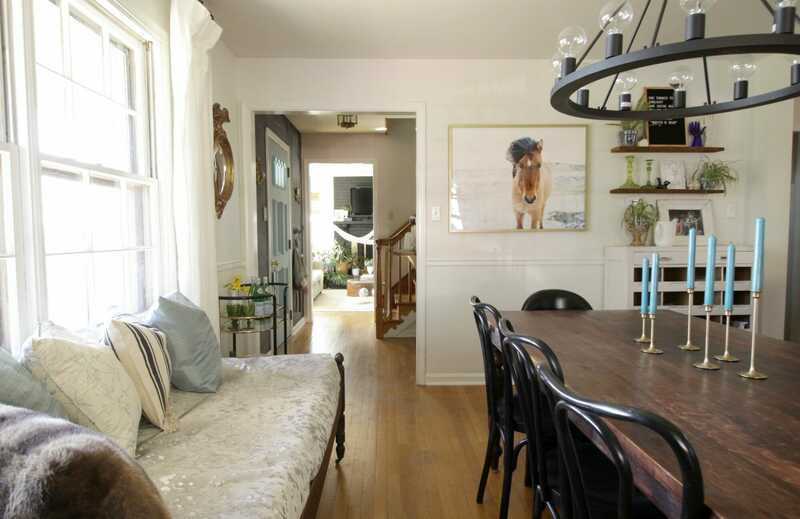 Here you can see how this space connects through the hallway to the living room. I try to keep them rather cohesive with their color palettes. Blue and green are once again the major players in my dining room. 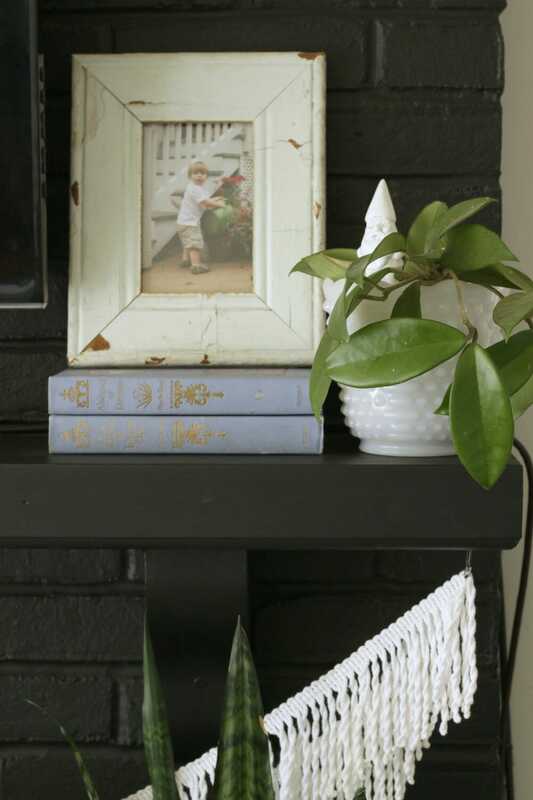 Our new reclaimed floating shelves (which I still owe you an actual post on at some point!) are one of my favorite areas to decorate for the holidays now. The letter board Chris gave me for Christmas is one of the first things I change when I need a little pick me up. This time I added a quote from A.A. Milne. Once again in here I used a spring like photo pf my kids to bring in a touch of the season and a bit of nostalgia for me. 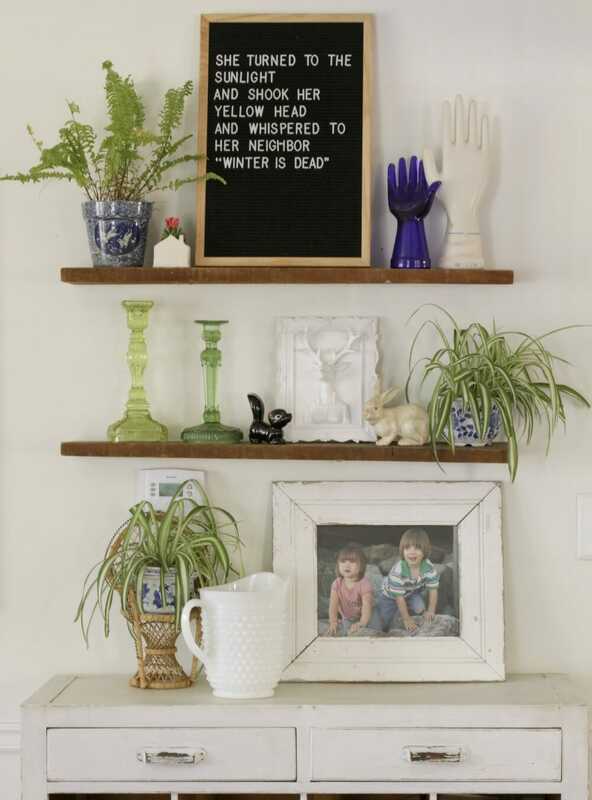 I hung the horse photo from Minted this past winter, and I love how it brings in the natural vibe as well as a touch of the blues and greens I love. Lastly in the dining room, my bar cart received a little sprinkling of the season. The weather is going to turn back to below freezing this weekend, so I clipped the meager daffodils we had so far and brought them inside. 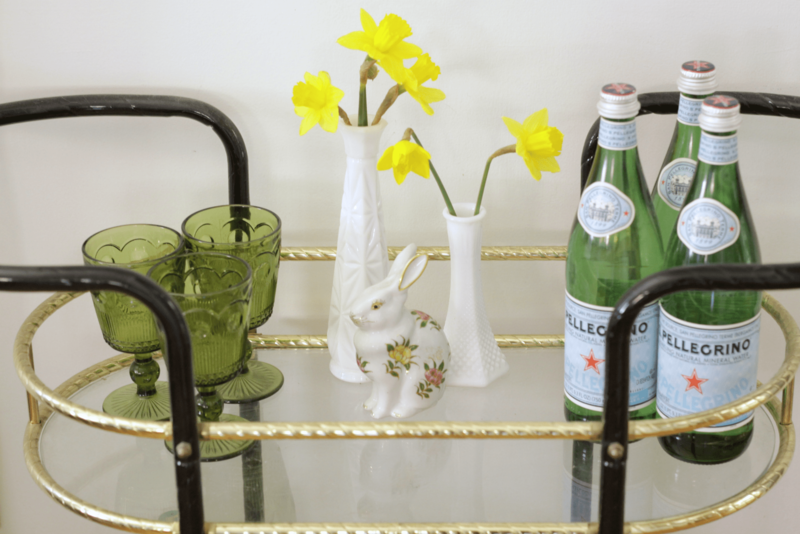 I added a couple of vases with those daffodils, a little thrifted bunny, and my thrifted green glass goblets to the bar cart for a Spring vibe. Check out the vivid yellow of those daffodils! Aren’t the stunning? We purchased bulbs from Costco last fall and I was thrilled when they started emerging from the earth. 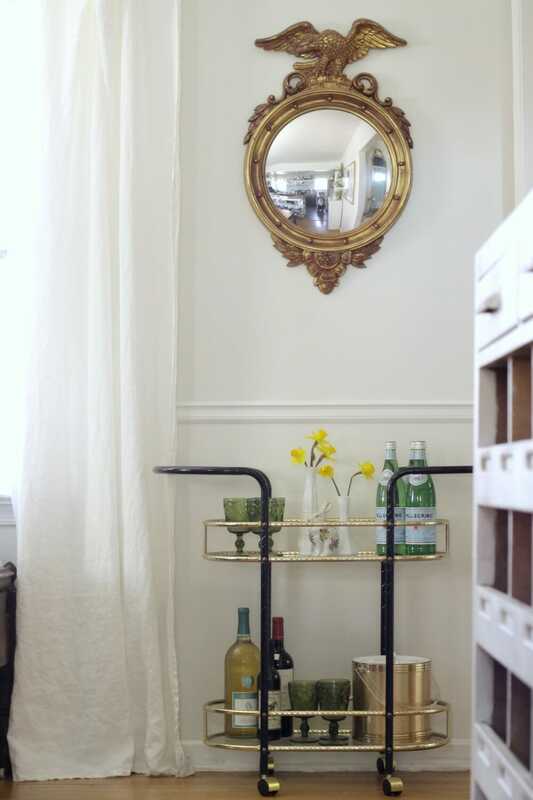 This weekend we are in for winds of 40 MPH and crazy low temperatures, so I think today I shall go ahead and stock that bar cart, don’t you think? That’s all of my Seasonal Simplicity Spring tour. I hope you’ve enjoyed it… it’s about as simple as they come! Now head on over to Robb Restyle for a fun and colorful tour, and be sure to check out all of the ladies below to see their homes this season. So glad you and Chris had a great getaway Cassie! Your house looks so pretty – I love all the greens!! hey you little jet setter! your home is always such a breath of fresh air. I so love ‘hers’ sofa. happy friday. aren’t those pillows so awesome!?!? they’re a fun change for me! come on over, april, and crack them open! Your house always looks so warm and cozy! Now pass the wine! i will pass the wine in a few days! Can’t wait to hear more about your trip, I’ve always wanted to see Seattle. Your home looks beautiful all springified!! Love the simple touches, and I’m crazy in love with those banana leaf pillows in the living room. 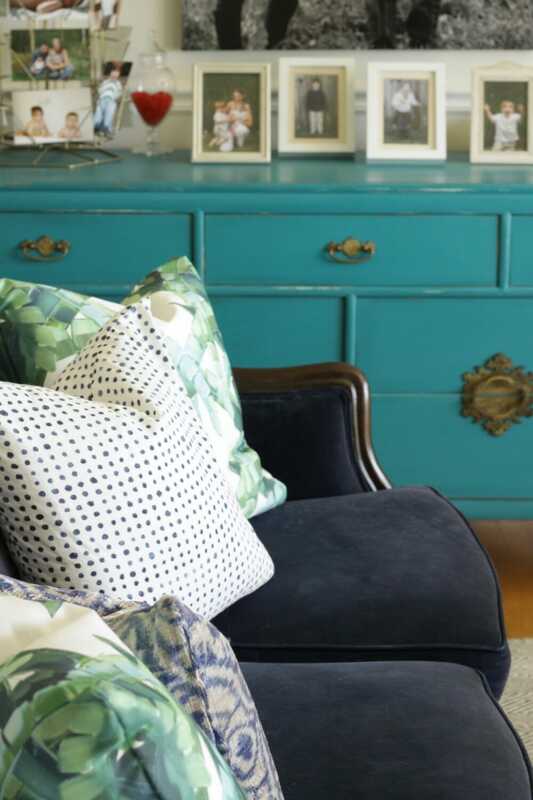 Looks gorgeous with the turquoise dresser! thank you so much, shelley! she has some black and white pillows like that you’d love! Yes!!! Crazy plant ladies unite! 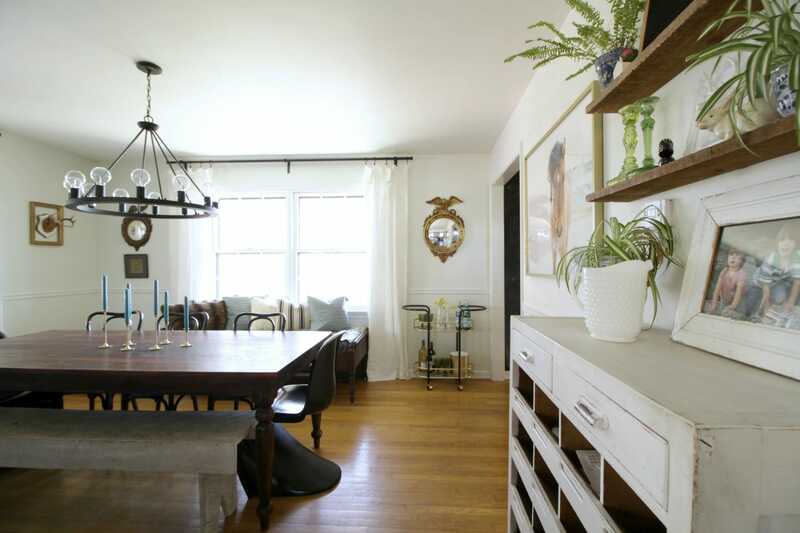 Beautiful home, Cassie – it’s so welcoming! And you know I love all that greenery! wooohoo crazy plant ladies!!! i loved your tour and your rich colors! What a beautiful tour, Cassie! I love your pillow combos and use of texture!! And that waterfall coffee table is AMAZING!! Hope you have a wonderful weekend, friend! thank you so much, abby! 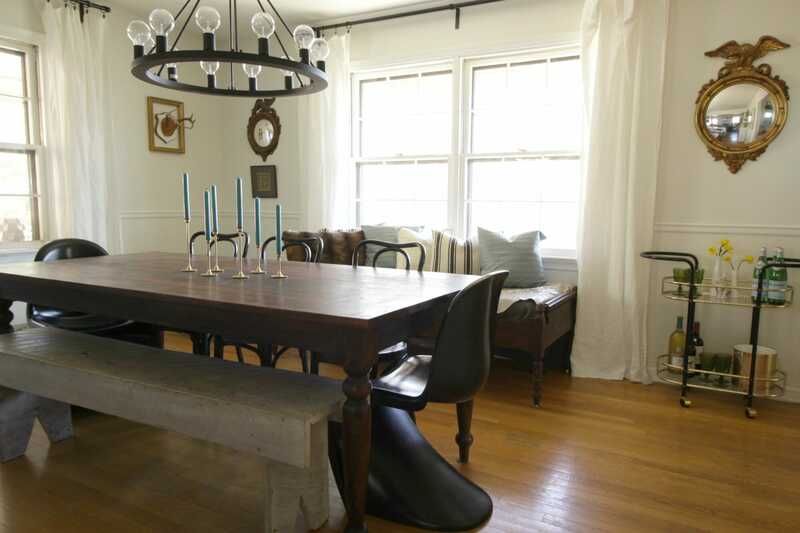 that table was certainly a lucky auction find… it’s vintage glass! the real thing! 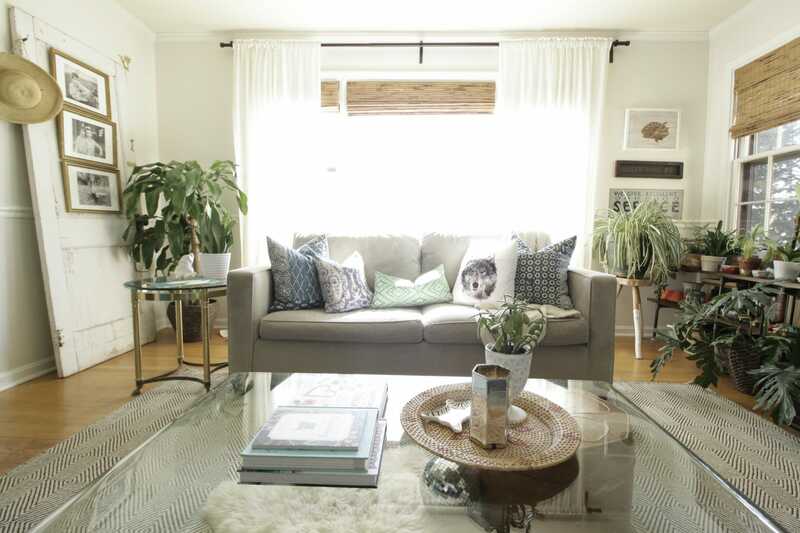 I just can’t get over how fresh and clean this spring look is for your living room. I love it! And by the way, I am totally in love with your turquoise sideboard. Now I want one!!!! thank you so much, shelby! i love the pillows SO much! Very pretty, Cassie! Is that a peace sign I see on the cabinet in your dining room? Love it! I’ve been sick too – no fun. And I have to agree with you about spending less. Just yesterday I vowed to dig through existing stuff rather than keep running out to buy something new. You did a great job using what you already own. man oh man…. I love that velvet sofa. it’s absolutely one divine divan. thank you so much, shannon! happy spring… although we’re buried in snow today! I love your eclectic decor – it’s beautiful! 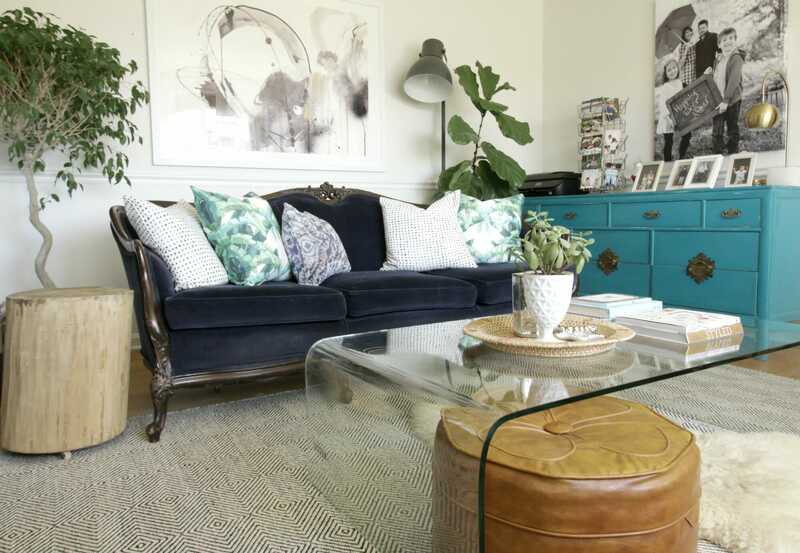 I am obsessed with your navy velvet couch – it is absolutely gorgeous! Hope you are feeling better… love all your beautiful plants. thank you so much! excited for our project entry next week! It all looks so amazing, Cassie – I’m ready for spring! I love all of your natural plants. I’m such a brown thumb, nothing survives. So pretty! Everything looks so pretty! Light and bright! Love all your plants and small spring touches. And all the blue is lovely. thank you, heidi! not very wpring like today- we just shoveled about 8″ off the driveway! Such a gorgeous tour, Cassie! I just love each new way you style your home! 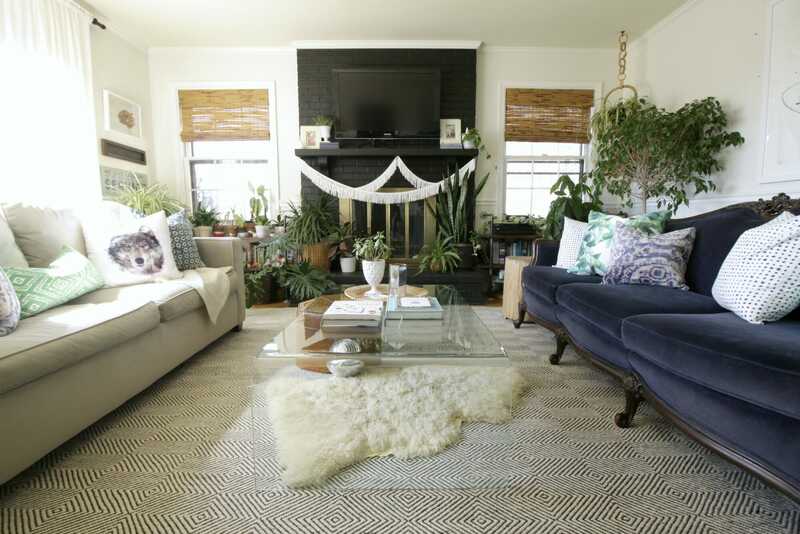 All the plants in the living room are just luscious, too! 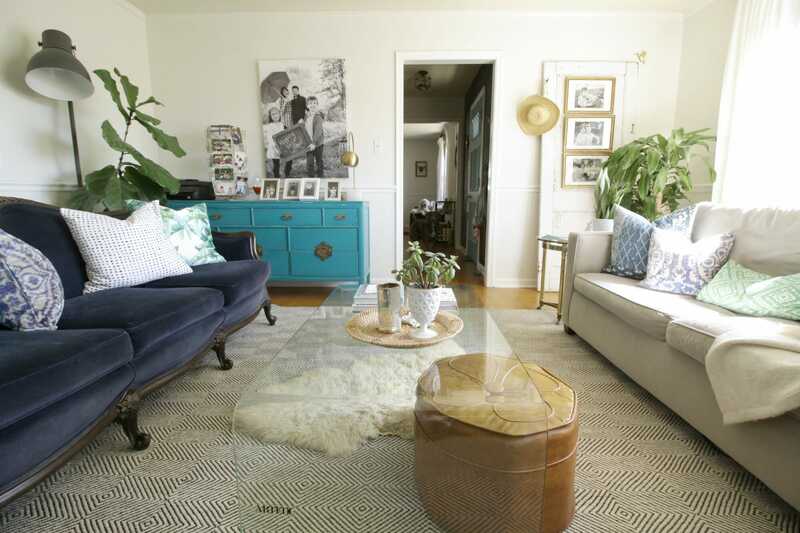 I’m officially in love with a sofa after seeing your amazing blue velvet one! Your house is gorgeous! aaaw, thank you! i appreciate the love! aaaaw, thank you, krista! and no worries!